Though still promising personal privacy, Facebook is offering marketers unprecedented access to user sentiment. To that end, the social giant just unveiled a “topic data” service, which will show marketers exactly what people are saying about particular subjects, including their own brand. For the effort, Facebook is relying on DataSift -- a data collection company with close ties to Madison Avenue. Among other topic data applications, a business selling a hair de-frizzing product can now access detailed demographic information on Facebook of users talking about humidity’s effects on their hair. Similarly, “a fashion retailer can see the clothing items its target audience is talking about to decide which products to stock,” Facebook boasts in a new blog post. According to Facebook, while such data can already be provided by third parties, its massive sale makes any insights far more valuable. 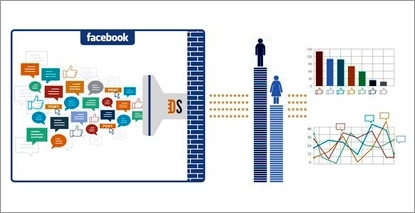 That said, Facebook is offering topic data as a way to guide marketing objectives. For now, it cannot be used to target ads directly. Having swelled well past 1 billion users, Facebook has been increasingly willing to test peoples’ patience for advertising, privacy-pushing endeavors. Last month, for example, the social giant unveiled Product Ads -- a format for brands to show off multiple product offerings, and in some cases, their entire inventory. Still, anticipating privacy concerns, Facebook insists that all the data it gathers is grouped and stripped of all personal information. To further reassure users of their privacy, Facebook says it will not collect data from its Messenger service. Facebook executives were not available on Tuesday to discuss topic data.